Carsten Nicolai is an audio and visual artist who has a studio in Berlin. 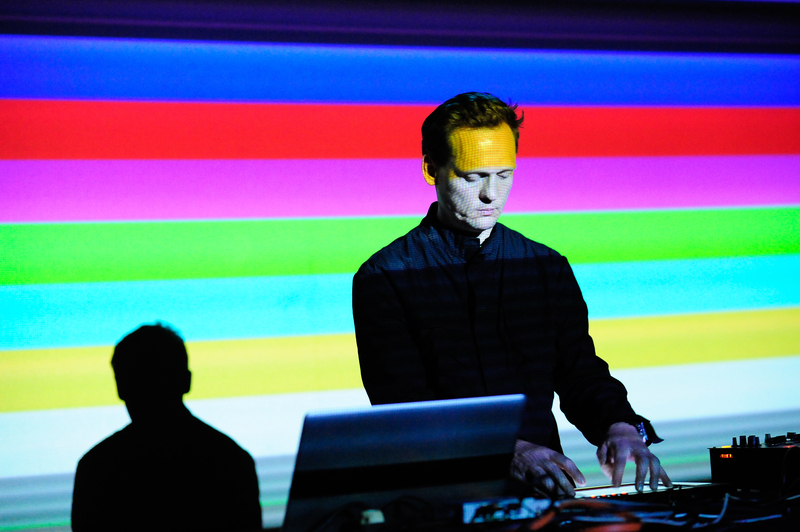 He has released under the guises of Aleph-1, Alva Noto and Noto as well as performing in groups including 6 Aus 49, Alva Noto + Ryuichi Sakamoto, ANBB, Cyclo., Diamond Version, Opto and Signal. In these various guises and groups he has released at least 45 albums and a very large number of singles and eps. While his release schedule is daunting it is only matched by a heavy live performance schedule. He also works on the production of radio plays in Germany. Innerversitysound: Can you talk a bit about the residency at the Baltic Centre for Contemporary Art, how did it come about? Innerversitysound: So the residency, was that an experimental section before you did the performances or did it just contain the performances themselves? Carsten Nicolai: No you have to imagine the residency was much more like a week. We had a studio facility there, it was quite a large studio space, studio complex and we could sit, work, make sketches and go do recording or do rehearsing and talk about how we wanted to structure the performance and which way we are doing it. It was just a space in the end, a studio space with some monitors and we worked together. Innerversitysound: And for this coming together, what was the focus of your experimentations, your shared ideas, how these translated into the live performances. Carsten Nicolai: You have to imagine when we all started, and Mika started earlier than Ryoji and I, when we started stripping down electronic music to sine wave frequencies and working with very basic elements like testones, we recognised our work without knowing each other. So I knew Mika’s work before I met Mika and I knew Ryoji’s work before I meet Ryoji and opposite way. It was a very small scene. Mika was living in Finland, Ryoji was living in Tokyo and I was living in Berlin. So we had been apart from each other but at some time we meet. We were all working on a similar topic, how electronic music should sound right now. So there was very common aesthetic grounds and later on as we meet we realised that we were a similar generation, similar influences similar ideas about what we think is interesting for us was not necessarily experimentation, we were interested in pushing the boundaries of experimental music further in being more stripped down, less melodic or whatever, and we being together more connected through our work. Innerversitysound: The death of Mika Vainio was felt as a loss by people who had enjoyed his music over the years. When I first started listening to him I researched everything I could about the empty set, set theory and other aspects of number theory. What you have just talked about sounds like you are getting into ways of how physicist connect sine waves through Fourier transformations. Were Mika’s concerns largely derivative of a fascination with mathematics and the representation of the digital arts in conveying the fundamental structure of sound? Carsten Nicolai: When you start using such stripped down elements, when you start working with sine waves there are no precise sine wave generators in musical instruments. So even if they say there is a sine wave oscillator inside it is not really precise, so we all started working with research equipment from universities. And Mika had a brilliant engineer in Finland who was building a lot of instruments for him, a transonic level and even made some visual devices. In the year 2002 we already switched to the digital domain so it was a lot easier to generate sine waves or whatever. But when you start using such equipment you start realising what you are doing because pure sine waves are not very interesting to humans or generally. Because they don’t have much overtones and they are very difficult to perceive. So that we just not stopping there, we wanted to have this experimentation that allows frequencies or very basic rhythms and when you start using these kind of machines, you start asking yourself well ok what is a sine wave, what is a frequency? And we have all been super interested, I remember conversations Mika, Ryoji and me, we had a lot of time when we were not doing music and we talked about string theories, about mathematical theories, multi dimensions and we had all been super fascinated by these theories and discussed all that because we all felt very connected. We felt very connected to these ideas and we felt that maybe we weren’t scientists but we felt very connected to these theories by reading books about them. Innerversitysound: You have had a history of working with Ryoji Ikeda, as Cyclo as well as in other contexts and you share with him the strong connection between the audio and visual as being a strongly integrated medium. Ikeda has concentrated on transposing what would seem like large datasets into his graphics and using data to drive the music and graphics. Whereas you have used the built cultural environment and physical phenomena as an impetus for reflection and representation. Can you tell us more about this strong externalist and scientific bent that you both share? Carsten Nicolai: This is a super difficult question, because sometimes we dive deep into mathematical topics. Ryoji’s very interested in multi-dimensional ideas of how to build structures more or less, this is all quite super general but we all started reading this theories and we all started developing our ideas on that but more from an artist’s point of view. It had an impact on how to program visuals and how to achieve visuals it was a part of the idea of the composing for visuals and in the end we had to write code in the end or make the theory up. Like how the program is working, what to isualise and how to visualise. So there was a lot of influence when you are reading this stuff, what kind of parameters are important for us and what are not. And it is a super complex topic, going from acoustics, from perception, from theories about how the universe are constructed. I think we have always been so curious about such general questions but also in the end about our own general topics. What frequencies do to us? How we perceive them? What is the brain doing? How much is really there? We had a lot of common ground in those discussions. Innerversitysound: Moving on to Glass, I was interested in your setup for Glass, the glass house itself and how you used contact microphones onto the glass and then you synthesised from that or digitally processed the sound from the microphones? Innerversitysound: It’s one of the most organic pieces I have heard from your output and that may to some respect reflect the aesthetic of the environment of the setup but why that specific direction? Was it more Ryuchi’s influence, or was it your direction, or why was it so seemingly more organic and closer to nature than to cultural artefact. Carsten Nicolai: First of all we were embedded in nature, The Glass House was in the middle of this beautiful landscape with this amazing view. And we really wanted to make the architecture a part of our instrument, it was clear from the beginning. And what was clear as well was that we did not want to play any kind of piece. Like musical piece that we did in the past or together. Which is quite repetitive personally and we had been very clear that we just wanted to improvise. And we never thought or rehearsed or tired out or spoke about what we wanted to do . We just did it… and I think such a thing you can just do when you know each other for a long time and you don’t need to talk much you just have to see what is happening in the moment. Innerversitysound: Ryuchi has described himself in interviews as having roots in classical music and the classical world view whereas it seems that your stance is unremittingly modern and there is quite a distinction between both of your sensibilities. How do you negotiate that territory? Carsten Nicolai: We know each other for more than 15 years I think. In the beginning it was a little bit difficult because I have no idea about classical notation systems, about how to describe specific frequencies as notes or to describe specific or bars as patterns or groups of patterns or whatever because I have simply used a different way of describing the things but in the end everything is getting kind of musically tied together and in the end when we realised that it is not important to find a common ground of what we are talking here about, notation systems. The moment we dropped all that, we worked a lot with micro generalities as good as anyway that is describable in a notation system, at least not so easy. The moment we dropped that, in this moment, the common ground it was there. So it was just a basic understanding and you need a very good ear to hear what the other is doing and what you are doing. Innerversitysound: Moving on to Unieqav, the album you have coming out in a couple of days. The initial inspiration for your Uni series derives from being booked to play at the Tokyo club Unit and how you adapted your sound for this environment. As a result the series has a strong beat orientation and as you have described it as a sonic representation of an underwater dive. This aspect of you output, focusing on situation based interests such as the club environment is only a minor focus of your overall output and how do you adjust your focus from your experimental work to the demands of the site as a focus of content. Carsten Nicolai: If you look at my catalog it looks like it is a minor part but when I look at what I have performed live in the last ten years, this is the major part. The Uni series is highly based on live performing. Most of the works existed already in a live performance before I went to the studio and recorded it. And it is the same with this record actually. Because I always develop things for playing in the live context and later I felt like that I want to record this. As artists you get this feeling that ‘ok if I am not recording this now I will never record this’. Because you already push your mind into a different territory and you are leaving a different kind of topic and moving or morphing into a different area. The moment you realise this you say ‘ok lets freeze it for a moment and just do a recording’. The Uni series was always the feeling that I am leaving this kind of territory right now, I should record this because it distracts me to not record it. So I started to record it. Experimental stuff, it is very different, I very much like to work in the studio and do experimentation and work on more experimental records but most of the time with experimental records I am not performing very much. Even Xerrox I didn’t perform very much, for many reasons, sometimes very personal reasons sometimes reasons that I don’t feel it’s the right setting. I think that a lot of these recordings from an experimental nature work very well in a private living situation like when you when you have good headphone or a good speaker system rather than in a concert situation. So every of release is designed for where I want to perform or what kind of direction I want to go in, the live performance but at the same time what kind of experimentation I want to do. For my personal recording interests and then maybe something crystallises and it will become a record or something. With reference to the opening track, Uni Sub, this was actually the last track that I recorded for the album and it became for me the opening track for the album. It a little bit represents this underwater dive, a little bit like early electro pioneers who always had this futuristic utopian underwater, like Atlantis or captain Nimmo, I have always been fascinated about that part and I kind of liked the sonic idea of that but when you listen to this album, I am kind of old school in this way, I still believe that people will listen to the whole album, even if it is not realistic to believe in this, but I still like this idea of the concept album and that the album opens up a kind of journey and that album makes sense what track follows after the next track for instance. For me the whole order of the tracks, how it is opening and how it is closing for instance, it’s kind of really important. Alva Noto pres. UNIEQAV @ MUTEK.MX 2017 from Victor Lara on Vimeo. Innerversitysound: The Uni series involves the collaboration of French sound poet Anne-James Chaton. Besides the actual focus of the poetry, the form of poetry condenses experiences and within a compressed form it elicits a maximal experience in the reader. Your music form in general seems to be a maximalist sound form, even though it may function in a similar manner to poetry. Can you tell us about how you see the conjunction of the different art forms are playing out in this series? Carsten Nicolai: I never took Anne-James Chaton as a sound poet. For me what Anne-James Chaton is doing is absolutely related to music and is absolutely as well related to sonic experimentation, even if he is just using words. I see very common ground inn this experimentation. If you look closer to his writings, because of course he was coming from a sound poetry, sound-slam background in France, but I didn’t know when I had met him. When I met him I just saw him as a performer, as a vocalist. So I had no clue of what scene he was from, but I really liked him sonically and the voice and the depth of the voice and everything and as we became greater friends I realised he had a very strong conceptual background based on the singularity of words; making lists and he is very fascinated with a kind of indexing of specific events, or specific moments, or specific words, or specific topics. In a way it is very similar to the way I work with sound so I thought it was a very good match. Innerversitysound: Did your working with Anne-James Chaton develop from a connection with guitarist Andy Moor and the live performances you did with both of them? Carsten Nicolai: Andy was a long term collaborator with Anne James and Anne James basically asked me if I would join one of the new pieces he wanted to develop with Andy together. So I became a kind of band member. But this project is really different because I think it is really Anne-James project, Andy and myself are joining in. So it’s really like the concept and the real structure is basically all created from Anne-Jame Chaton. And we kind of supported this idea, he was directing us I would say. Innerversitysound: Can you see a future album where you concentrate on live poetry and live music together as an overall focus? Carsten Nicolai: It’s really funny you saying that because I was just last Saturday performing with Anne-James Chaton a new piece where we are trying to do this much more closely. We call it Alphabet. And this we developed together very strongly. We just had a prototype presented in France this weekend. Innerversitysound: As a side note how did the album with Iggy Pop reciting the poetry of Walt Whitman and you doing the music come about? That was really left field for your listeners. Are you reorienting your focus from physical and scientific phenomena in your music towards a more poetic vision of art? Carsten Nicolai: It’s a friend of mine who writes a lot of theatre plays and radio plays. And he did a radio play on Walt Whitman, for the poems which had been translated into German, with the original English with Iggy Pop speaking. Basically Tarwater and I are long term collaborators with him on radio plays and so he asked us to join in and create tracks and when we basically worked with the material from Iggy Pop we realised this is kind of like song material that we had created for the radio play. So we made a release for pressing on the tracks we did for the Iggy Pop voice. That’s how it came about. I have been working for more than fifteen years on radio plays as well which is probably not as well known, because they are mostly produced in Germany.